Dimensions 0.56 by 5.50 by 8.25 in. 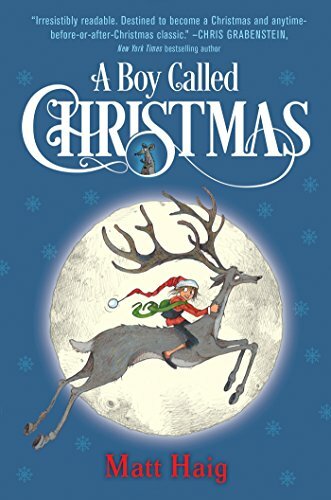 Amazon.com description: Product Description: Before there was Santa Claus, there was a young boy who believed in the impossible. . . . Lemony Snicket meetsÂ ElfÂ in this warmhearted Christmas caper. Along the way, Nikolas befriends a surly reindeer, bests a troublesome troll, and discovers a hidden world of enchantment in the frozen village of Elfhelm. But the elves of Elfhelm have troubles of their own: Christmas spirit and goodwill are at an all-time low, and Nikolas may be the only person who can fix thingsâif only he can reach his father before itâs too late. . . .
Sparkling with wit and warmth, A Boy Called ChristmasÂ is a cheeky new Christmas classic-in-the-making from acclaimed author Matt Haig and illustrator Chris Mould. About: Before there was Santa Claus, there was a young boy who believed in the impossible.